Arctotis 'Peachy Mango'™ is an evergreen perennial. It forms a dense clump of attractive silver foliage. The large daisy-like flowers provide a bold splash of color from early spring through summer. This is a great plant for containers or in the ground. Arctotis 'Peachy Mango' is an evergreen perennial. It forms a dense mound of attractive silver foliage that looks good all year. The flower stems are curled over at the end until the blossoms are ready to open. The showy flowers are about 2" in diameter and are a stunning peachy orange color with a dark brown "eye" in the center. They start blooming in mid-spring and are covered in flowers until the weather becomes really hot. On the coast where it's cooler, plants will usually have some flowers until winter starts. Plant Peachy Mango in a sunny spot in soil that's not waterlogged. It's tolerant of heat, clay soils, coastal salt spray and takes winter temperatures down to 20°F. Peachy Mango African daisy looks good at the front of a mixed border and is stunning when planted in groups. It also makes a really good container plant. Arctotis are native to South Africa. 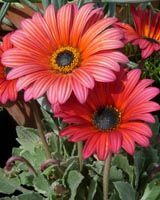 'Peachy Mango' is a hybrid arctotis and part of The Ravers™ collection introduced by Euroamerican Propagators from their breeding program at Sydney University. Great in containers or in the ground.